"Dye mon, gen mon" (Beyond the mountains, more mountains). Before travelling to Haiti this summer, I researched the needs in Haiti (and they are many). As a gynecologist, I was drawn to their desperate need for a comprehensive approach to cervical cancer prevention. 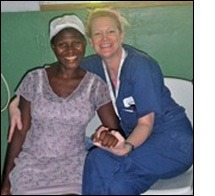 Cervical cancer is the # 1 cause of cancer death for Haitian women. Haiti has the highest incidence of cervical cancer in the world - a preventable disease in developed nations, but an agonizing death sentence in low-resource countries. Despite the obstacles found in low-resource settings, much can be done to decrease the incidence of this cancer, by identifying the precancerous stage and treating it before it progresses. Many studies in India and Africa have shown that inexpensive techniques: "screen and treat" in a single visit, can markedly reduce the likelihood of women in impoverished countries from dying from cervical cancer. It took months of creative thinking and charming strangers with our beginning creole, but ultimately we accomplished what we needed: we purchased a full nitrous oxide tank was transported from Port-au-Prince to Cap-Haitien, where we picked it up, brought it to the medical clinic we were to work. To our relief it fit our only cryotherapy unit. The next day we opened the clinic to Northern Haitian women for their first speculum exam. Together, our team screened 120 women over three days, with 22 women testing positive for cervical dysplasia. These women all accepted immediate treatment in the form of cryotherapy, with no pain medication other than ibuprofen and Heather singing and sometimes praying with this spiritual group of women. At the end of our trip, Heather and I brought our findings and our hard-won equipment to the large teaching hospital in Northern Haiti: Justinien. There, in gynecology grand rounds, I presented first the world-wide data, then Duke University's findings in southern Haiti, and our own small study (n=120) in their own neighborhood. Our main goal was to inspire, support and offer tools. We were very encouraged by their reception. The Northern Haitien gynecology residents share our frustration about cervical cancer in their country and were very motivated to take on the project. Handing over our hard-won equipment after the presentation felt much like handing over a "torch" to the chief of gynecology, Dr. Cyril LeConte, a well-respected, talented physician. His residents asked intelligent questions, asked for future communications, and were open and enthusiastic about the "see and treat" method. I felt like a little candle was lit. It was enough to make me feel grateful for the sacrifices made by many to light this candle.